Jio Fiber Plans, Location Accidentally Revealed; 100GB Data at 100 Mbps, Free for 3 Months! Jio Fiber Plans, Location Accidentally Revealed; Free 100GB Data p.m at 100 Mbps for 3 Months! The talks and rumours about Reliance Jio’s broadband offering, named as Jio Fiber, has been going on for some time now. But an accidental leak on Jio’s official website has revealed some interesting details about Jio’s future plans related to Jio Fiber. This accidental leak of details was partially possible because of a Reddit user, who shared a screenshot of the locations where Jio Fiber can possibly be launched in the initial phase. However, this section of Jio’s official website has been shut down as of now, and the URL is not accessible any longer. But on the Internet, nothing is permanently removed. We will show you the contents of the hidden website, and share some interesting details about Jio Fiber, which is all set to disrupt broadband internet market in India. Just like Jio’s telecom entry, Jio Fiber is all set to make a disruptive entry into the market, by offering world-class services, free of charge. As per the contents of the hidden website accessed by us, Jio is going to offer 100 GB of data, at a speed of 100 Mbps, and the services shall be free for 3 months. Once 100 GB is consumed within a month, then the speed will drop to 1 Mbps. Note here, that a security deposit of Rs 4500 is mentioned in the website, which can change later. Earlier, it was rumoured that Jio Fiber will offer 100 GB of data at Rs 500 per month, and the services would be launched from Diwali onwards. The details of this plan were not found on the website, but can be added later. 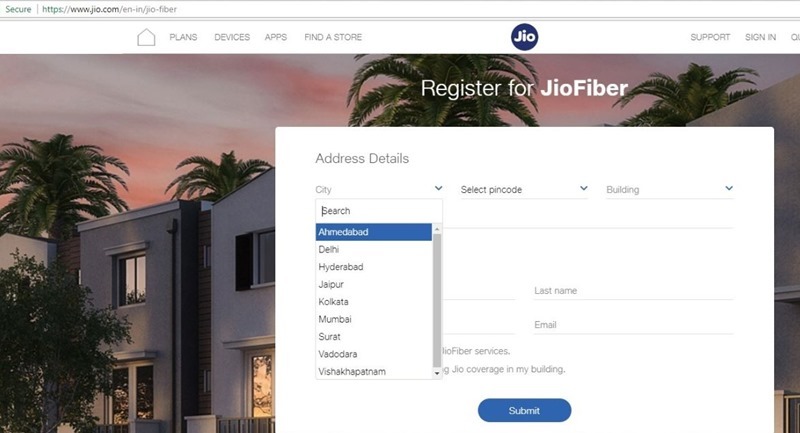 As per the screenshot shared by the Reddit user named nromil, Jio Fiber would be initially launched in these cities: Ahmedabad, Delhi, Hyderabad, Jaipur, Kolkata, Mumbai, Surat, Vadodara, and Vishakhapatnam. Again, this information was recorded when the developers must have been doing some testing on the website. The list can be expanded, or reduced when the actual launch happens. Under each city, Jio also shared the exact building complexes and locations where the service would be rolled out. It seems that Jio has installed a custom router under each of these mentioned building complex/localities, and in case the user wishes to use their own router, then the security deposit can be reduced. Another option in the leaked website states: “I am interested in enhancing Jio coverage in my building”; which means that Jio is right now expanding their network, via a mesh network of routers, and they are seeking assistance from users all across the selected cities in this endeavour. You can access the cached version of the hidden, leaked website of Jio Fiber here (This is Google cache and can go off at any time). The live version has been shut down by Jio, and contents can change when the mini-portal is finally live. "Jio Fiber Plans, Location Accidentally Revealed; Free 100GB Data p.m at 100 Mbps for 3 Months! ", 4 out of 5 based on 8 ratings. GST Being Exploited? 77% Of Consumers Paid GST On MRP; Retailers Forcing Consumers To Pay Double Tax! I am looking for Jio Fiber internet in Gurgaon, Cybercity at my Office. Could you please ask a representative to get in touch with me ? Thanks for sharing the information for jiofiber. Can you please let me know the location where Jio is installing JIOFIBER? I m using it in Ahmedabad from last month. It has refundable deposit of Rs.4500 /- for 3 month . the speed was dazzling fast @ 95 mbps ( download ) & 90 mbps ( upload ) . It was fiber optic cable that provide this kind of speed .very very happy with it. Up to to the mark indeed. The set top box is all in one , with no antenna but contains 3 LAN port , 1 telephone line jack , 2 USB port & WPS button. Rumor says they are planning to launch digital cable tv channels in next 8-10 months through Ethernet cable ( how they do ?? ) . Nice to know, Dev! :) But I’m always curious to know this – what’re you planning to DO with all that data and all that speed? :) Like, how will your life change now, what will you be able to do, that you couldn’t do before? Forgot to mention that , you got 34+ mbps on wifi & 90+ mbps on cable. Yes, it definitely change , world become small now . Everyone need speed, speed in all things. My back up now completed faster. It really helps when your TV connected to your device. Faster streaming / mirroring / downloading . your daily tour to digital world completed faster. lol. I am in new ranip area and waiting the same since long time. In what other locations of ahmedabad are they providing demo? in which locality do you live in ahmedabad? plz can u tell me in which area do u leave in Ahmedabad? and how they contact you? Basically they are replicating the cellspot feature that T-Mobile has deployed in USA with their specially designed Asus routers. That’s the easiest way to increase coverage without investing heavily on towers.